There is something all-American about Jello. It is a staple of many family traditions, whether you’re making cut-out Jello jigglers for kids to play with or your great Aunt Betty is making her famous (or infamous) Jello salad to bring to that potluck picnic. Jello is fun to work with and can create some stunning desserts with its bright, jewel-like colors. It may not be entirely gourmet, but I definitely have an appreciation for Jello and have been known to make the occasional Jello dessert just for fun. This Fresh Strawberry Jello Ring makes a beautiful and fun summer dessert. It can be made in advance and showcases fresh strawberries in a very retro way inside of a deep red strawberry jello ring. The ring is actually easy to make, it just requires a little bit of patience as you assemble the mold and wait for the jello to set. The trick to suspending fruit in jello is to work in layers. Fruit, no matter how light it is, will always sink to the bottom of unset jello. 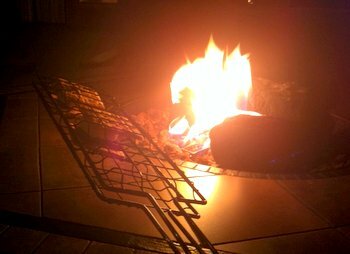 I constructed this by working in several small batches, allowing each layer to set up before adding another. My first two layers contained the fresh, sliced berries, and the remainder of the jello was left plain. You could also add in layers of blueberries or raspberries for another layer of flavor. I used a regular bundt pan to create this dish, not a special jello ring (although if you have one, feel free to use it). You can make your mold taller than this one by adding an extra layer or two of jello without changing the methods used here. To unmold, simply fill a large mixing bowl with hot water. Dip the bundt pan into the water for a couple of seconds (3-5 seconds should be plenty, you can always add more time). Immediately unmold it onto a serving platter by placing the platter directly against the pan and flipping it upside down. 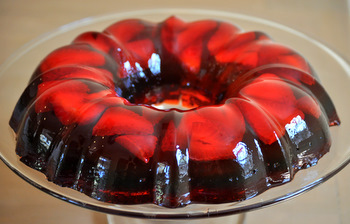 The unmolded jello can be stored for 1-3 days in the fridge, and is best when it is served the same day it is unmolded. Pour 1 package of strawberry gelatin into a small bowl. Pour 1 cup of boiling water over gelatin and whisk or stir vigorously to dissolve gelatin. Allow to cool for 5 minutes, then stir in half of the chopped strawberries. Pour into an ungreased bundt pan and place in the freezer to allow the gelatin to cool and set for 20 minutes. While the first layer cools, prepare a second package of gelatin in the same way. Pour 1 cup of boiling water over gelatin and whisk or stir vigorously to dissolve gelatin. Stir in remaining strawberries. Allow gelatin to cool at room temperature for about 15-20 minutes. When previous layer of gelatin is lightly set, carefully pour the hot gelatin over the first layer. Return to the freezer to allow the gelatin to cool and set for 20 minutes. Repeat process to make remaining three boxes of gelatin. If desired, more strawberries can be added to subsequent layers. Make sure that the previous layer of gelatin is lightly set before adding the next layer, and pour hot gelatin into the pan carefully to avoid melting already set layers. 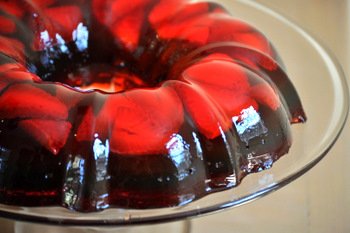 When jello ring is complete, store in the refrigerator for 4-6 hours, or over night, to allow gelatin to completely set. To unmold, fill a large mixing bowl with hot water. Dip the bundt pan into the bowl for 3-5 seconds to loosen the jello. Immediately unmold it onto a serving platter by placing the platter directly against the pan and flipping it upside down. Serve immediately, or store, covered with plastic wrap, in the refrigerator.